In the Sew Colette sewalong organised by Sarah and Erin, this week was designated Meringue muslin week. As you know, my week has most certainly not been a sewing week! With an exam on public administration on Monday and an essay on phone hacking due on Thursday, it was all journo hands on deck, which, as I’ve mentioned before, doesn’t tend to leave a lot of time for sewing! The Flickr group is already filling up with bloggers’ renditions of the a-line skirt, but I’ve decided to skip the muslin part of the project. Not exactly in-keeping with my less quantity more quality sewing ideal for 2012! Laziness: One of those fast fashion habits I’m afraid! When I have made muslins, I’ve rushed through the process without really taking the time to check fit and wearability. Cost: While muslins tend to be made from easily-afforded cheap fabrics, my fabric budget isn’t exactly significant while I’m still training as a journalist. Waste: If I buy fabric, I want to use it and wear it. Where’s the sense in my taking a pledge against buying unnecessary garments from the high-street when I’m sewing garments which gather dust after I’m done adjusting the fit? A popular tactic in the sewing blogosphere is to make a wearable muslin. The fabric may be cheaper than what you’ve bought for the garment proper, but it’s still a garment you would wear. Take Melizza for example, who has made a wearable muslin to see how the scallops would look in a lightweight cotton. Before Christmas, I drafted up my own pencil skirt pattern. In this case, a muslin was a must because it’s such a closely fitted garment which had been drafted up based on my measurements in the summer – even a minute change in measurements is going to affect the fit on a garment as form fitting as this one. The result is a pencil skirt I’m still going to wear (because I’m stubborn!) but with clear indications of fit issues. Take the wrinkles across the front and on the zipper – this means I need to add a bit more width to this garment. I made this in a cheap-as-chips polycotton I had lying around in my stash – imagine if I’d made it with something a bit more expensive? Mind you, the fabric wrinkles very, very easily – does anyone know if the wrinkling would be less obvious in another fabric? 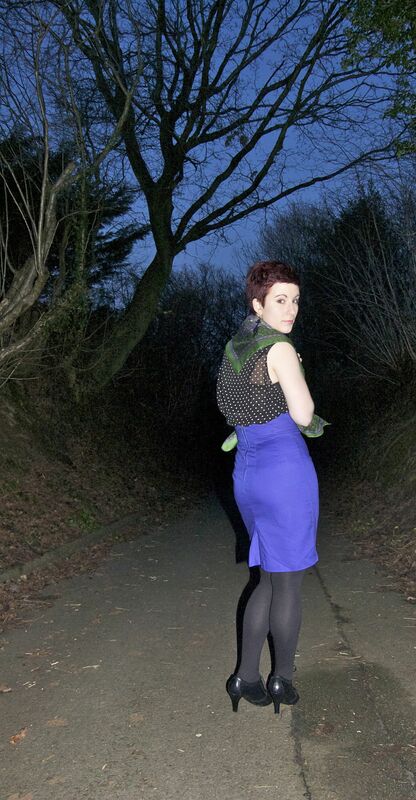 I’ve popped more photos of the skirt up on my Flickr page if you want to take a further look! The Meringue skirt is less formfitting than my pencil skirt, so I should be OK if I make sure to use a generous seam allowance in case any adjustment is required! I was gong to draft a waistband according to the Coletterie’s helpful tutorial, but I’m not sure if this would be sensible when I’m not making a muslin. Any readers taking part in the sewalong? I can’t wait to see everyone’s finished garments! I have no internet at my new house which has made catching up with blog reading a bit more difficult! I’m sewing along with Sew Colette! I’ve never really thought about the sustainability and cost of muslin-making before, mostly because I’m so new to muslin-ing. Last year I skipped muslins and made a couple skirts that have some decided… issues. I never wear them. It feels like a waste, as well. Huh. Anyway! All my muslins are done in secondhand or free fabric, and you’ve convicted me to try to repurpose them once I’m done! 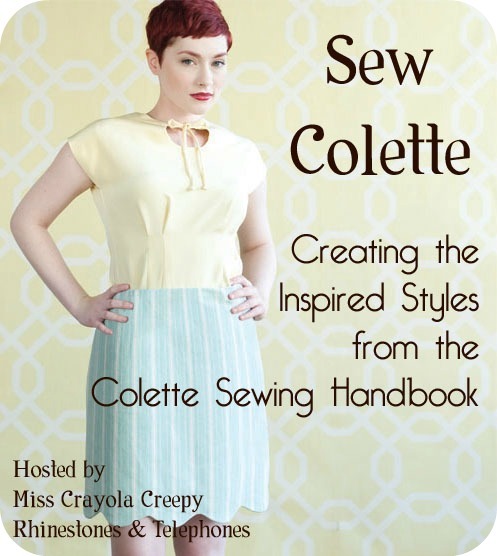 I’m a late comer to the Sew Colette sewalong, my book should get here Monday. I think muslins are great if it’s a pattern you’re going to make multiple times, might as well get it right the first time. I have a bolt of sheeting I use for muslins, but I do feel bad after sewing them, and having nothing to do with the muslin once it’s made. I probably won’t do a muslin for the Colette skirt, but will for any tops, and the bodice for any dresses (where I have the most fitting issues). I just bought some expensive wool for a sheath dress, and will definitely be making a muslin for that one. Your pencil skirt looks great! I’ve been wanting to try a pencil skirt, but am worried about making something so close fitting. I’m also very impressed you drafted it yourself. I’m having the same issue (to muslin or not to muslin). Part of me says screw it as I do not have the funds and am trying to cut down on waste as well. Another part of me says “Woo… girl! You better do a muslin!” based on all of the fitting woes I read about. So… who knows. I didn’t make a toile for my Meringue skirt. I don’t have any scrap fabric big enough and to be honest I didn’t want to spend £3.99 per metre on calico just to cut it up, sew it up and throw it away! My main fabric cost the same – if it didn’t fit, fair enough, but luckily it did so now I have what I suppose you would call a ‘wearable muslin’! I love the wearable muslin idea. It makes it seem like a less waste of time. I always use bargain, pretty, fabrics for my muslins. If it comes out, great! If not, I learn from my mistakes and save it for scraps.